the set comes with 5 dies: 2 clouds, 2 pieces sun and the rainbow. All papers are from the clutter on my desk, I die cut the rainbow 1 times on all the colors, then the white clouds and last the bright sun. Then is was time to put the color of the rainbow all together one by one. Im not sure if you can see it but it has the bottom border of the card cut it using the rainbow die. And finally with Memento Black ink stamped the sentiment "Sunnier days ahead"
this second card was made using some of the left over rainbow color pieces to looks like a circle ...assembly on the left- middle of the card, die cut a white border with the word HELLO which I colored using my Prismacolor pencils added the red with twine button and the yellow sequins on the right top corner. on this one, you know that I love CAS cards, Great so this you will love it! I had all the left over pieces of the rainbow to the front of the card, trying to look a lot like a background of circles, added the sequins to contrast all the great colors. What do you think? We can use the same die to make a few version of the same card. I love this set of dies and how you have made three completely different cards. They are so bright, colourful and could be used for so many different occasions. How fantastic showcasing 3 cards, all so different, using the same set! They are so bright and happy and sunshiny! Beautiful ... Happy cards Patricia! Love them all ... how creative! 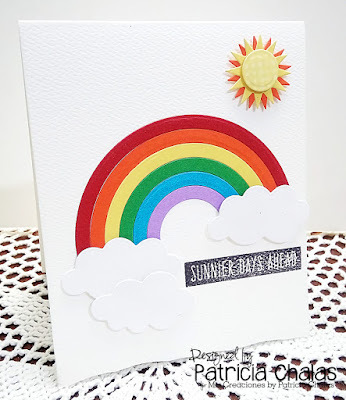 I would have never thought to use the rainbow dies like you did on card #3.......amazing! Love them all. Me neither until I saw the left over! and just follow along!! Thanks Ann. Fabulous cards Patricia! 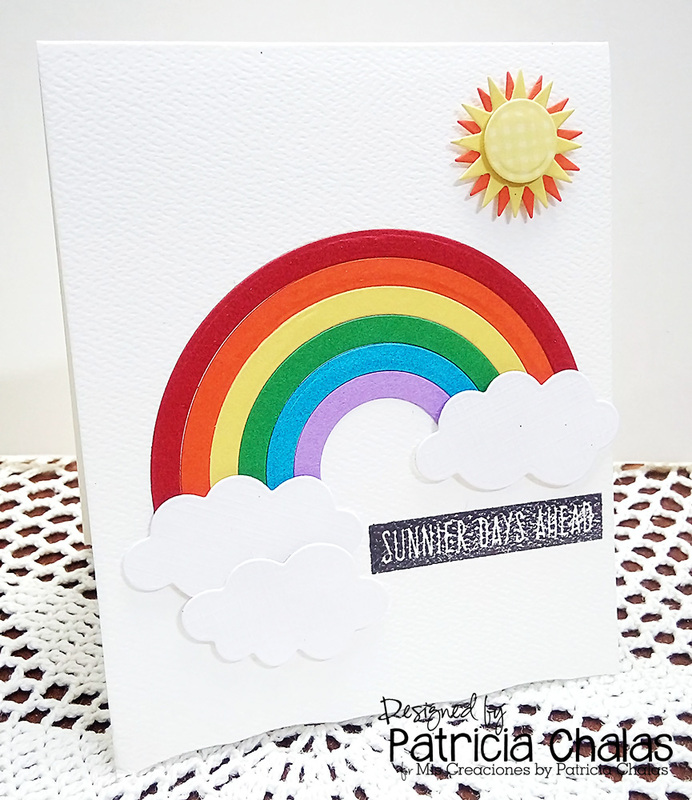 Your clever uses of the rainbow are so inspirational! I couldn't pick a favorite because they're all great!! such creative ways to use this die, I love when we can find more than one way to use our dies, terrific post!! Love both beauties, especially the third. Could be used for the Olympics in August. Great uses of displaying the dies.